This post is great, you have a ton of patience to write so much ! Very useful post, will send this link to a lot of my friends who have such questions. Superb, well analysed, well strucutred post. Trust you to comeout wiht such a brilliant piece. 1.32L capacity, has the widest turntable -350 mm. This helps to place larger trays or cake pans while baking. Has minimum of 100 C with 10 C increase till max of 250 C.
Grill has 2 variants - grill 1 and 2 with different heating. Garlic bread, grilled SW at grill 1. Have not tried grill 2 so far. 3. MW - max power is 1000 W -I love that because veggies get cooked that much faster.A cup of peas cooks in 2 minutes. Keep up the great work Suma, you rock. Indeed a very helpful post for all the new bakers!! One of the most useful post I have read in recent past. Very well written and equally informative. Lovely post. Very informative and precise. Will keep coming back. I ahve an IFB conveection oven.It came only with a tall wirerack..Any idea where can i get a shorter wirerack for baking purposes? I have a IFB convection oven which came with a tall wire rack.Any Idea where can i procure a shorter wire rack as you mentioned? @ Rozz- Thank you! Yes, I think you must get a short rack for baking..
@Rafeeda - Think your oven is fine. Are you sure you are using the pan size recommended in the recipe? Try again and let me know..
@Rozz - Sorry, missed the question, check with IFB service center or try online.. Excellent writeup Suma. Love the extensive writeup. I read through it, admiring the honesty and patience with which you have written this post. Like you know, I too use my micro with convection a lot and have faced issues for larger bakes. Again, kudos for this detailed writeup. I have a question though, Sometimes while baking only in the convec mode, when I open the door of the oven to check if the cake/cupcakes are done, it causes a Disaster and wrecks the entire rising of the cake. Can you help me sort out this issue please? Thank you. @Shopaholeo - Am glad! The cakes could be sinking if you have tried opening the door much earlier than they are baked. Avoid opening the door too often. If you have just begun baking, stick to the recipe measures, recommended pan sizes and open the door only towards the end of the specified baking time range. Thank you so much. A very informative post. I have used my Samsung convection oven only for microwaving and grilling pizzas! I was planning to but a 30-40 lts OTG for baking - but looks like I do not need it! Thank you for your effort.I recently bought an Lg microwave n as a beginner your blog was sum thing I was searching for. I would appreciate if you would tell me if I can use a metal tray on a low rack to grill fish etc. While using low rack alone stains my glass turner inside. Also can a silicone bake wear be used for grilling/ crisp mode? Thanks for the information, but I was wondering how the microwaves combi with grilling uses the metal rack, has anyone tried it? I feel a bit nervous trying to grill and microwave at the same time as using the metal grill rack, even though the instruction say I can, I am confused though! Hi, this was a wonderful read for someone like me who has been wanting to bake, owns a convec microwave but doesnot know a single thing about microwave baking. One question that I would like help with is what kind of containers can we put in? I have a highwire rack that I got with my IFB so should I buy a tray? Thanks, as a beginner the information provided has been really helpful. I have rarely used the convection mode on my microwave. While baking, Is it necessary to put the baking tray on the low metal rack, Can the baking tray not be directly put on the glass bottom of the microwave in convection mode? Forgive me for the really late response. @Nitya - Not sure if the food would get properly grilled as it would be away from the grill on top. Guess you can use silicon, have not used the grill mode much. Use the tall rack for grilling. @ Erika - Not tried, but if your manual says you can use, try it! @ Amu - Have mentioned the kinds suitable for baking, hope you find ur answers above! @ Razina - Please get your microwave checked. @ Roshan - Your oven seems to be setting at higher temperatures than it indicates. Have it checked, a good oven thermometer can tell you the exact temperature. your post is awesm. thnaks a lot for the post as i made my first cake in my LG microwave after geting proper guidence from the post. cud u pls tel me how to set the power level in difrnt mode i.e high, medium, low? n do i nid to set the power level in stead of timer , while normal heating??? Thanks for such a great article. Really I learned a lot from it. Thanks again. Great tips for baking ! Great information..thanx so much..I always scared to use microwave. How can i use the microwave to bake cheese cake?? Cleared all confusions.. keep up the good work. @Apple Flower - Yes you could! All baking on Convection mode. @Lavanya - If its a basic microwave, there wont be options for pre-heat and temperature. Please make sure its a convection microwave. Very Nice Post.it's very nice blog and this is very useful for me thanks. I use to do online ifb microwave as its time saving. Thanks for the information I am going to buy my first MW so looking for information and came here. It solved all my queries and now I am going for LG MW, have a question, Is the auto-cook menu useful? should I go for more auto cook menus? also found some features like Indian Bread Basket, Healthy Fry etc. are they really useful? Also what is Motorised Rotisserie is it useful? should I go for it? "2-level convection bake" I am always confused which to use for baking cakes and which for cookies and which for pizzas. Can you help me on this. Thank you. @Vidya - I do not use the auto functions, don't do much by way of cooking in the microwave. Motorized rotisserie is mostly for cooking meat. @Min - Sorry, no idea about this. This is exactly the kind of post I have been looking for after my purchase of Samsung microwave. Very informative post. Write more posts for beginners. Thanks. 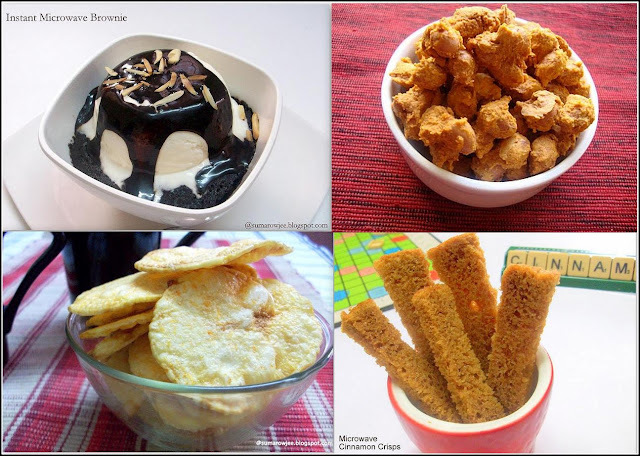 @Piyal - The baking time depends entirely on the recipe, the pan size etc. So please pick a reliable recipe from a good source and bake as it instructs you to - give or take 5 minutes. Thanks for such nice post. I have tried baking white bread with my LG convection oven. The bread came out nice but the upper crust is not that brown as shown in videos I followed. Secondly it breaks while I cut it. Any suggestion will be helpful. hi suma...great post...have a few doubts...used to make pizza on an OTG with prebaked base..the base used to be crisp. Now i have bought a convection samsung microwave(28l) and when i make a pizza on it the base remains soft. i use the high rack and grill mode..is that where i am going wrong? and in the convection mode should i do this also?? @Viji - Try baking the base on convection mode. Better still bake your oven pizza from scratch! @ Heba- Sorry, haven't used the combination mode at all. Thanks Suma for insights into the functioning of microwave ovens. I have a query.. What can be a roast-equivalent (as in roasted vegetables,etc) in such 3 mode microwave ovens. I tried the Grill mode (I have LG) but was not quite satisfied with the results. Anushma - I do not like grilling in the microwave either. Try baking them on convection mode. The liked Pioneer Woman's potato parcels(here on the blog), try that way too. Awesome post thanks for sharing. Now i will follow these tips while baking food in my microwave oven. Great information!!! I've had my Half Time Oven for a few years and have yet to really use it. Thank you! Hi... this the kind of article i have been looking for a really loooooong time.. I knew that i can bake in my microwave apart from heating purpose.. but dint know how!!! and here comes ur post explaining in detail about how the same can be done..
Can I use the non stick tawa which came with starter kit as pizza pan? What is the right temperature for the oven to be pre heated when the recipe does not indicate it? Had this doubt...when we bake a cake,if we double the quantity of ingredients then is there any rule that you follow to determine the new baking time? Sorry if this question has be asked/answered earlier. Thank you. Very informative.. thanks for putting it . I was directed to your blog by one of the members from home bakers guild. Very informative indeed. Thank you so much. I cannot say how thankful I am. I ruined my initial cakes on the microwave. So witched to good old cooker. Now, your post gives me some moral support to try the oven once again! hi suma, i m planning to gift my mom one of the MW oven, honestly i have zero knowledge about this. after reading your article i got some basic idea of MW's. The post was very detail and moreover it is very clear in every aspect. Appreciation is a small token for your efforts. But thanks ultimately. I'm so glad I stumbled upon your blog. I always wondered about Convection Microwave Oven and what it's use was even though I own a LG one and have never once touched the Convection button. I've always been scared of that button not knowing what it could do. So thank you for taking the time out to teach us mere mortals of the use of the MW when baking! Now I can let my poor, old OTG to rest and use my MW to start baking with confidence. I have bought Samsung oven before one year, but I used it only for reheating purpose.. I was looking for baking tips to make cake,your article sounds awesome yaar...thanks a lot..
Hi.. I've a Samsung Convention oven, I tried to bake a cake with the steps mentioned above for 2 times, both the times the cake is not baked inside. The outer part is cooked, but not the inner, its not bulged..texture is soft..but not cooked. In Samsung Oven, after Pre heat, we have to select the option for Baking Cake 5-1 which automatically sets the temperature. I feel that temp is not sufficient. Please help me to bake cake perfectly. Thanku soo much for this post!! helips a lot! wonderful instructions. I will make an attempt again to bake it the convention way. in Usha otg till now but never tried in my LG convention oven till date but today am gonna start it but I don't have my booklet ..can you pls tell me where to get my booklet of Lg . And also what tem I should bake a normal and chocolate cakes etc. pls help me. @Usha - Did you check with the service center? Or the website? Very nicely explained.. I have convection oven since 4 yrs but never experimented convection mode.. Was baking only microwave cakes. Thanks. Thanks a lot...this post has cleared so many of my queries related to using my IFB microwave oven with combination modes...I tried and failed everytime i baked and come up with either too hard or not properly cooked cake...i hav almost gav up....hope this post will help me to come up with an excellent cake baked by myself. hi suma thank u so much for the article. i do hav an LG 28 ltr convection microwave and i do baking, i always thought i made a wrong choice picking up this microwave rather than buying a conventional OTG, cuz of the bakeware i had to use. i read in many articles people forbidding the use of aluminium in microwaves, so i had to buy only borosil dishes or silicon cake pans for baking. Also the guy who came to install my oven gave a strict no-no to metals in convection. Have u tried baking with aluminum pans. i am so much in dilemma cuz of abundants of misinformations i was given by many ppl in internet. 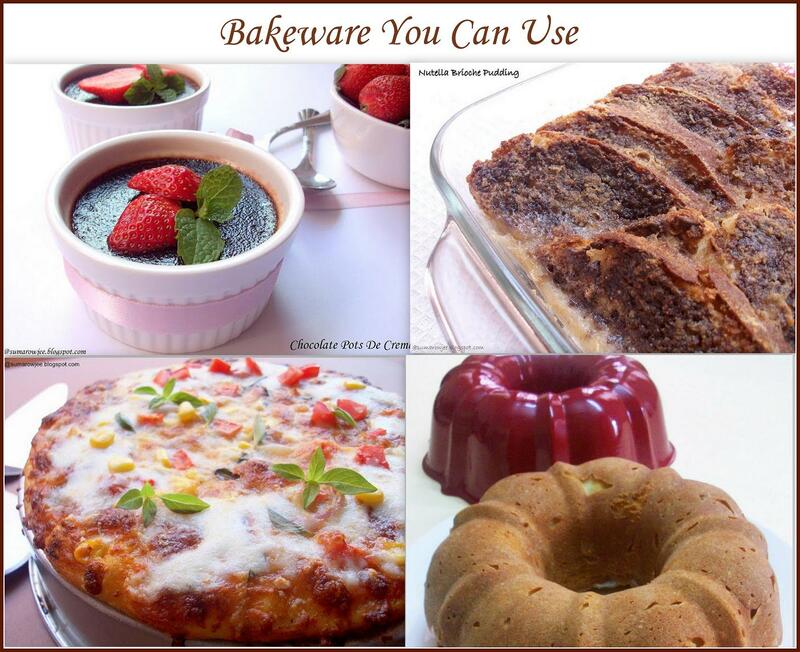 Can i dare to use aluminium cake pans in my convection microwave ??? Hi, Suma, great post!! Helped a lot. I have a question though..I bought a LG convention oven recently and preheated the oven for the first time ( thx to your post :-)) but there was a faint burnt smell from the oven..is this normal?? I had placed the lower rack while pre-heating..pls advise.. Thanks Meena! I have never experienced that problem, better get it checked once. @ Harika - Definitely you can use aluminum pans! Please go ahead and use them in convection mode. thank u so much for this information and now, i am going to enjoy baking even more. Will try with aluminium pans and let u know and i am a new visitor to ur blog and i am very glad that i found ur blog. thank u once again for ur time and all the wonderful posts and tips. hi sumaji...ive tried with aluminium pan and the cake came out good. thanks to u. Thanks Suma. 1 more question; if I am making pizzas at home, do I have to preheat again after I make the first Pizza? Not necessary if you put the next one immediately. If you wait 2-3 minutes then, pre-heat again. Thank you Ma'am for this exhaustive and wonderful post. i just bought a samsung convection microwave. After i preheat by using the convection mode, the timer automatically starts for 10 mins as soon as the pre-heating is completed. is this the time for which the oven will remain heated or is something wrong? please guide. Thankyou for your help. Thank you Kiran! Once the oven is pre-heated, it should maintain the temperature for the time you set.Did you try setting the time? No Ma'am, as you showed in your video that after pressing the convection button we should press start. i did the same thing. Should i set the timer for pre-heating also because i thought timer is automatic for pre heating at required temperature. Kiran, no need to set the timer for pre-heating. i hv godrej convection microwave.I don't hv any rack. can we place directly aluminum cake tin on the glass turntable?????? pls help. Please do get a rack from the Godrej service center and then place the tin on tin when you bake. Thanks for the concept of pre-heat. I have always been confused about how to use pre-heat in our Indian microwave, as most of the post are about foreign MWs. Very useful post... U saved me from buying an OTG while I have a microwave oven.. Thanks a lot Suma. great job. @Niranjani - Sorry, late in responding. You could be using the a smaller tin than needed? Please do choose a good recipe and follow the instructions. Am sure your cake will turn out great! @Priya - You could go in for an OTG as you would be able to bake larger quantities. Do check out models in Morphy Richards, buy one with atleast 40 liters capacity. Do check reviews for the model you plan to buy. Good luck! @Ferwin - The higher one is for grilling, use the shorter one for baking. Does the manual specify anything? very interesting and informative post.Thanks for these good instructions of Microwave oven user. Thank you Suma. I have an otg and microwave in my house but will soon be living in our rv full time and it only has a microwave/convection oven (no grill). This is a whole new learning experience for me so I really appreciate your informative video. My settings look quite a bit more involved than yours with lots of helpful buttons for melting and softening etc. It also has a Combination buttone which you don't touch on and I don't know when I'd ever use it. Thank you again! Hello ji.. recently I bought a Samsung microwave oven which has both convection and grill but there is no separate preheat button in it.. could u pls tel me how to preheat my oven.. Awesome post, very informative thanks. One question I have a springfom pan (the latch is of steel) can I use it in my microwave? Thank you Shyama! You can surely use it on convection mode when you bake. I have Morphy Richards MW Convection oven, when ever i bake a cake the upper part and the side become crispy however the batter remains the same in the lower middle part. Request yout o guide me on this please. Great knowledge ....i have a doubt....there are articles that suggest not to use plastic in microwaves as they lead to cancer.is it true? ?if yes then wat to use?as glass is difficult to use and maintain. Yes, even good plastic can be harmful. Glass is difficult to maintain agreed, but the safest. Please use it. Mam, thank you so much for this article. Its been a huge relief in helping me narrow down my choice to convection microwave. What I would like to know is that recipes mention oven temp and tume . is that for an otg or can the same temp and time be used in convection microwave? Thanks for simplifying all the basic things about the operation of a convection microwave oven. It was very helpful to me.